The aviation industry needs to have comprehensive flight tracking solutions to improve safety procedures and information dissemination to passengers. Utilising an S17 panel PC allows optimisation of the current flight tracking system as well as the versatility to adapt to future flight tracking applications. Air traffic controllers can seamlessly receive real-time updates from both the aircraft and passengers by utilising 17” panel computers with Intel®-based CPU. In the aviation industry, its flight control room handles a massive influx of data 24/7. At the same time, the future of the industry is also being shaped by standards on real-time flight tracking updates. So, its flight tracking system would need a high-performing, sturdy device that can manage future flight tracking software. Now, what are the features of a device that optimises and future-proofs flight tracking operations? Ideally, it should have an Intel® Core™ i7 processor for high-performing computational function. For flight-tracking, an embedded watchdog timer is also essential to monitor operating conditions of the internal system. Plus, a projected capacitance touchscreen option for easy navigation. As luck, as it would have, our S17 rugged industrial panel PC can have all these specifications. So, what makes our device advantageous for flight tracking operations? Keep reading this blog to learn about the pros of installing this type of device in flight tracking control rooms. The UK’s aviation industry now faces challenges from heavy air traffic and timely flight updates. The International Civil Aviation Organization (ICAO) recommends new aircraft to autonomously broadcast its position, especially in distress mode by 2021. These two demands are amongst the contributing factors to upgrade its flight tracking system as well. However, our 17” ruggedised PCs were built with the intention to improve flight tracking solutions and address future possibilities in the industry. Key features like the Intel® Core™ i7-3610QM, quad-core processors, thin client options and sunlight readable display can be built in this device. Therefore, it can streamline flight operations and prepare an airline for prospects in the industry. As a flight tracking system provider, integrating such kind of sophisticated software can indeed work best with industrial panel PCs. So, what should be the requirements needed for flight tracking software? Here’s a comprehensive list of the advantages of S17 rugged enclosed PC. One of the challenges in flight tracking is handling a large volume of data. However, our 17-inch panel computer has an Intel® Core™ i7-3610QM 2.30Ghz with 500GB HDD storage media option. This means that our device can handle and process multiple information. Not only does this upgrade a flight tracking system, but it also can support future flight tracking programs. This device also has projected capacitance touchscreen option which offers seamless navigation. Plus, its Intel® GMA HD4000 DX11™ GFX core with 1280×1024 resolution provides an excellent display, offering excellent information viewing. There are different apparatus involved in flight tracking. But, having a robust computer that is easy to install in conjunction with equipment is indeed advantageous. Thus, our 17” panel PC has an arsenal of serial and USB ports. There are also options for the number of ports by preference. Moreover, it has VESA, cased or bezel mounting solutions so it can be set up in many workspaces. With heavy air traffic and amendments to aerospace safety regulations, airlines are looking for long flight tracking solutions to address these two challenges. Moreover, one of the ideal solutions is to utilise advanced computing devices. 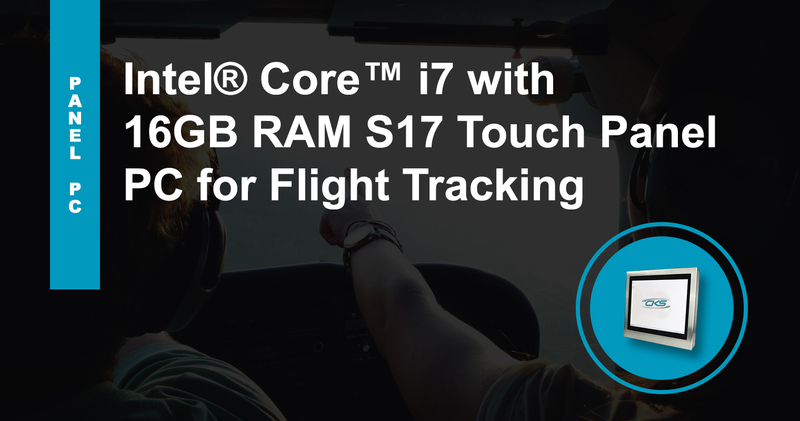 Fortunately, our S17 industrial-grade touch panel PC has the specifications to handle large volumes of data, support future flight tracking applications and operator-friendly interface. Download a FREE datasheet of our 17” industrial PC today or contact us through (+44) 014 3874 7111 for further inquiries about our product.